May has been a bit of a bust in the flower department. April was so gorgeous and lush..but not so much for May...but I'm hopeful everything will pop in another week! 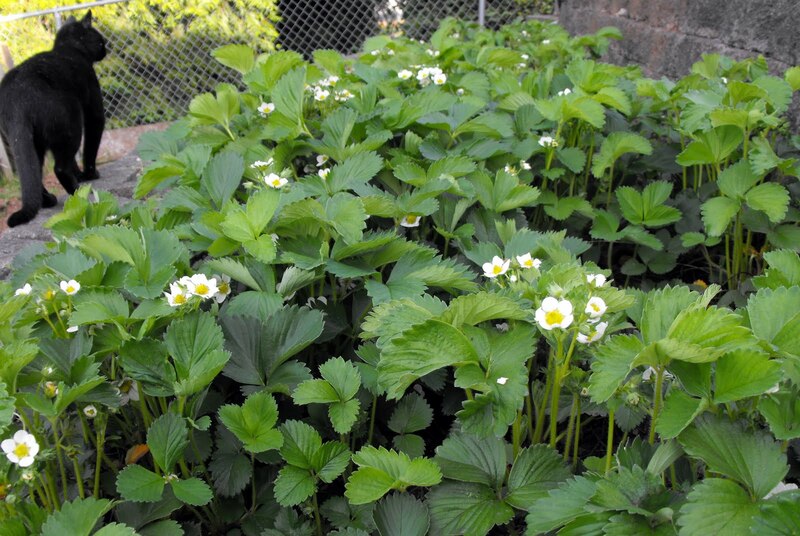 The Strawberry bed is looking good! We've had some long awaited sunshine and I'm thrilled. Hoping the veggie garden will sprout soon! 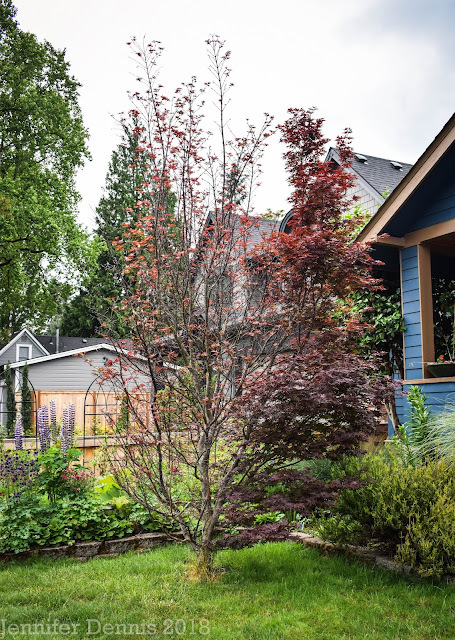 Stop by May Dreams Garden to join in the 15th of the month fun! I love how you have a black cat too that wanders by while you're busy working away taking photos. I have four of them if you count the neighbor cat. They don't want to be involved, yet there they are... Maybe it's just their territorial nature. 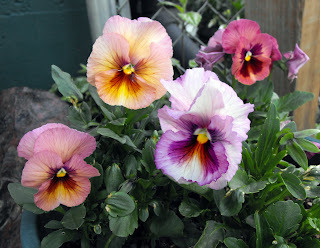 Jenni ~ I'd say you have quite a few lovely blooms for May and a sweet kitty keeping you company as you work and stroll through the beauty you have there. Lovely Bloomday posting! Thanks for sharing. What gorgeous bloom Jenni. 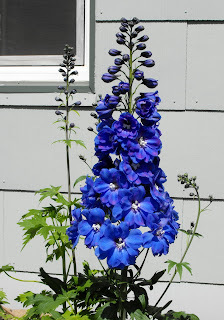 Blue Delphiniums always look so pretty. 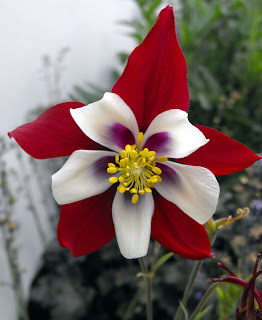 I love your red and white columbine. Wow! Would love to find some seeds for that one. That is a gorgeous columbine. Lovely blooms for May. That columbine is really neat! Love the cat patrolling the strawberry garden, helps keep the birds away! 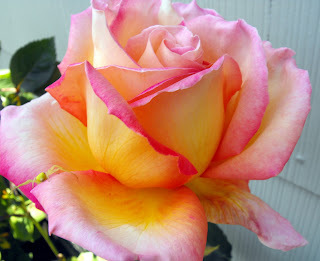 Love that rose - It looks like one Bob use to have that I have to buy for him again. We moved and didn't take it. I love your Delphinium and Columbine. Everything is gorgeous! I love the Columbine, pansies and Delphinium, how beautiful. The rose too of course! I read this post on my phone and was unable to comment, but wanted to let you know your flowers are gorgeous! 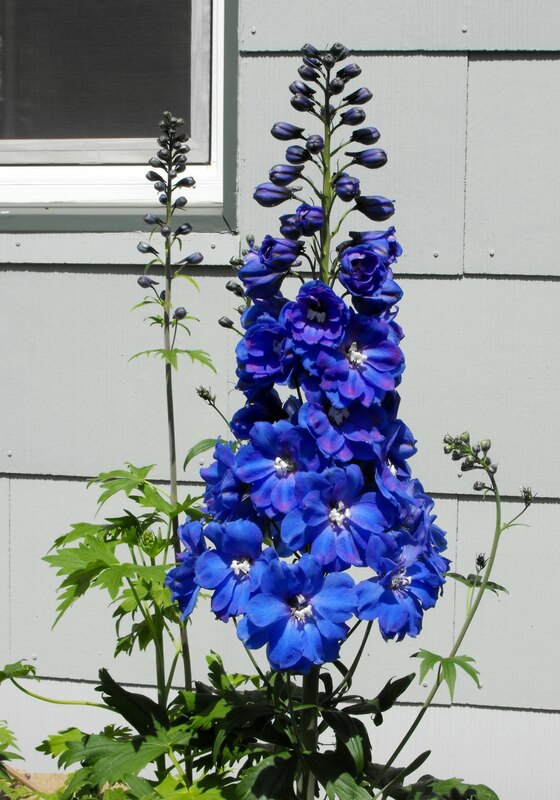 I especially like the delphiniums. I am going to try columbines this year, I really admire them, but have never grown them before.